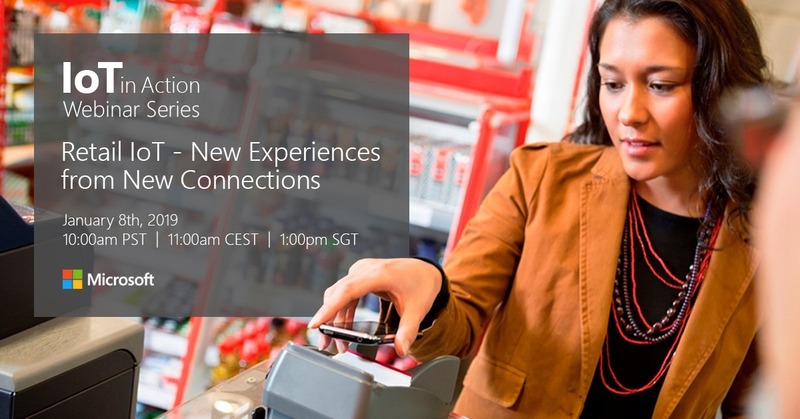 For in-depth insights around the latest developments in IoT for retail, including how customer expectations are changing and how IoT investments can impact store profitability, register for our live IoT in Action event in New York (co-located with NRF 2019) on January 14, 2019 or sign up for our industry-specific retail webinar on January 8, 2019. In-store retail continues to account for approximately 90 percent of retail sales, but the retail landscape is changing. According to IHL, nearly 10,000 stores closed in the United States in 2017 – but another 14,000 opened. In the new retail environment, successful stores are focused on improving the customer experience and in-store operations with the goal of offering truly frictionless shopping. IoT technologies are helping to transform both efforts, allowing rapid testing and deployment in a common platform that spans both digital and physical environments. A customer can only purchase something if they can find it. By analyzing traffic patterns in the store from cameras and traffic sensors, then layering this data on top of inventory and purchase data, stores can optimize their physical layout, so shoppers can quickly find items and be inspired by complimentary items. Where online retailers try to get products in front of customers in the fewest number of clicks, IoT technologies can help brick-and-mortar retailers minimize the number of steps a customer has to take. One of the reasons customers shop in stores is to get in-person help from sales associates. But if the sales associates don't interact with the customer at the right time, sales and upsells can be lost. That’s why companies are creating IoT solutions that use existing video infrastructure to offer intelligent retail insights and recommendations that help stores convert shoppers to customers. Also working to improve the retail customer experience is Genetec™, a Microsoft partner who has IoT solutions that leverage existing store security cameras to provide retailers with customer and operational insights to improve business outcomes. For example, their solution can detect increased congestion at checkout terminals to reduce abandonment due to delays checking out and provide customer traffic and flow information for making good merchandising decisions based on that intelligence. Even if the right item is in the store, if an associate can't find it and hand it to a customer, it won't get bought. IoT solutions can help make sure every item is on the right shelf. They can also keep track of items that are moving within the store, for example to the fitting rooms and the sometimes-cluttered racks outside them. IoT solutions are also enabling retailers to glean far deeper insights into customer needs, preferences, and buying habits. Microsoft IoT solutions can assess how customers interact with your brand and the products on your shelves. They can help gauge customer sentiment and track search and buying habits through Dynamics CRM. These insights can enable retailers to truly personalize customer experiences and promotions to increase loyalty and market share. Secure IoT solutions on the intelligent edge and intelligent cloud can increase operational efficiencies and reduce costs. Add in the Azure Sphere solution, which ensures end-to-end device security for MCU-powered devices, and retailers can focus their efforts on reimagining everything from business models to product experiences. Intelligent supply chain and micro-warehousing: Keeping items stocked at the right levels and anticipating demand surges is critical to a retailer’s success. Microsoft inventory management solutions streamline and accelerate supply chain and inventory management processes to improve efficiency, agility, and cost management. IoT sensors can track inventory levels in real time and send alerts when levels dip. Workforce empowerment and efficiency: Many repetitive tasks can be shifted from associates to IoT-enabled systems. Shelf compliance monitoring is one task that can be automated to free up staff time. Companies are even using robots to scan entire stores and help employees take immediate action based on their findings. This enables associates to be brand ambassadors rather than shelf checkers. Increased security: Some customer-focused improvements, like Mobile POS within the store, bring with them increased risk of shrinkage, both intentional and unintentional. Video surveillance of mobile checkout transactions is challenging, but partners like Genetec have created solutions so that all checkout activity can be located and recorded, which is especially important as more transactions occur away from fixed terminals. To explore IoT for retail in more detail, be sure to register for our retail-focused IoT in Action webinar on January 8, 2019. You will get insights into how IoT can help you delight customers, improve the effectiveness of your associates, and increase the efficiency of your operations. You can also learn how intelligent edge and intelligent cloud IoT solutions can transform your retail business by signing up for Microsoft’s in-person IoT in Action event in New York City on January 14, 2019. Finally, you can take a deep dive into building retail IoT solutions at our upcoming 2-day Virtual Bootcamp in late January and early February.